Do you happen to know a Super-mom? 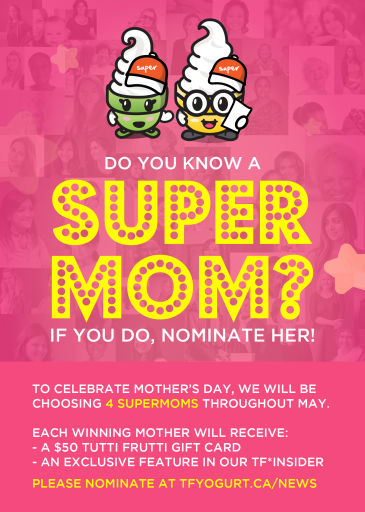 Its that time of year again, last year we had over hundreds of nominations for SUPER MOMs all over Canada, This year we want to hear from you again! If you do (whether she’s a community hero, the glue that holds the entire family together, or simply just the coolest mom on this planet), here’s a chance to recognize the difference she makes! Before we proceed, do you have permission to nominate this person? If not, your nomination may be withdrawn if your nominee does not want to be included in our contest. Please confirm before proceeding. *Please note that this nomination may be public on our tfyogurt.ca site and social media platforms. What makes her a Super-Mom? © 2019 TF Yogurt Canada Inc.